Whether it’s your first or fifth time to Bali, this beautiful spot will be sure to capture your heart and soul, more so with a delicious daily practice of yoga and meditation, healthy food and great company. 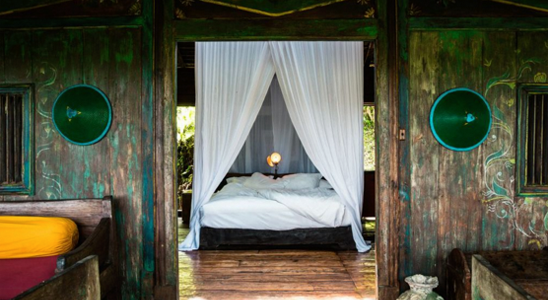 Amanda Morrall, owner of The Yoga Tree, and Perry Macdonald, founder of Ayurveda Health, are delighted to be your hostesses on this special five-day retreat July 16-21 designed to add to life to your years and deepen your yoga, in all its forms. Read on to discover what’s on the agenda and what you can expect. Pictures say 1,000 words so you get the idea I hope. This will be your home during the retreat. A 10 minute drive away from the hustle and bustle of Ubud, Bambu Indah is gorgeously situated, overlooking a rice field, perfect for enjoying breathtaking views during yoga, enjoying spectacular sunrises and sunsets and unwinding from city life in Auckland. 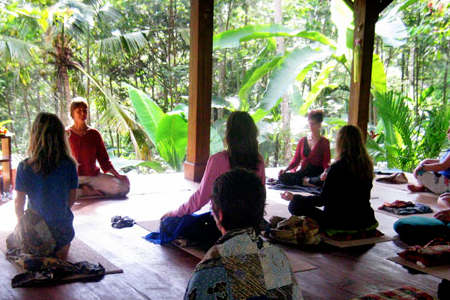 Our retreat will be a relaxing combination of yoga, health talks and tourism set in one of the most beautiful places in the world. Bambu Indah is an eco-friendly boutique created by Jonathan and Cynthia Harding, co-creators of the internationally renown Green School as well. 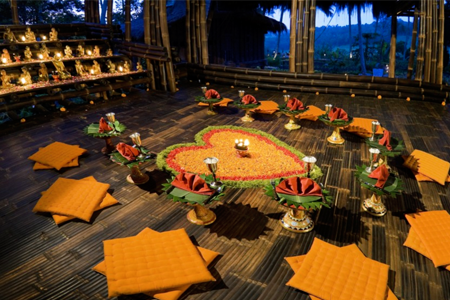 For only $300, Perry and Amanda will share their expertise on yoga, health and wellness and lead some optional outings including: the colourful spice market in Ubud, the Green School Village, sacred water temples and a day of massage. Details TBA. 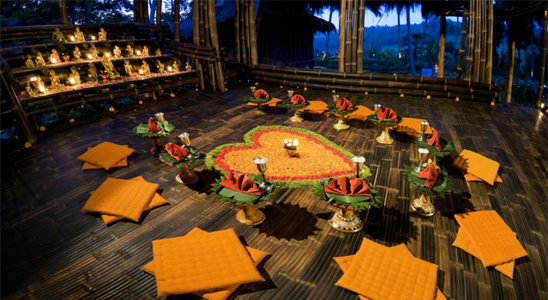 Accommodation and airfare will be the responsibility of our guests however we have booked a block of houses available for our exclusive use along with the main Yoga Shala at Bambu Indah during our time together. The retreat will officially start Saturday the evening of the 16th at 8 p.m., and will close Wednesday evening on the 20th. Daily classes led by Perry and or Amanda will be held at 8.00 a.m. till 9.30 a.m. Meditation (optional) will be held at 7 pm. nightly for one hour. This may be include some light practise in a restorative style, Yoga Nidra or therapeutic yoga. Perry will be leading several talks on Ayurveda so you can learn more about the sister science of yoga and how to find more balance in your daily life using this ancient knowledge. Travel to and from Bali will be left up to participants given the range of flight routes and prices etc. Flights are currently on sale for as low as $800 return if you don’t mind transiting through Australia and a few hours delay. Otherwise Air NZ flies direct. Virgin Airline has a moderately priced option, $1,300 return, with a two hour lay over in Brisbane. Earlier bookings will reduce the cost, so we recommend booking flights ASAP once you’ve confirmed your placement on this retreat. Travel visas can be purchased at Denpassar airport upon arrival for a cost of $25USD. The travel time from Denpassar Airport to Bambu Indah is approximately 2 hours depending on traffic. Bambu Indah charges $35 per car for the transport or you can organise your own from the airport. $30 USD is about the going rate but it’s easier to arrange this in advance as arrival as the airport arrival section can be confusing and crowded after a long flight. 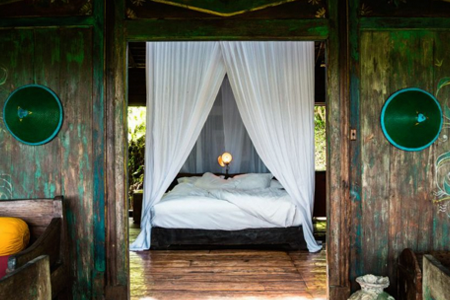 Bambu Indah is very comfortable so it’s tempting not to leave however there is plenty to do and take in around Ubud. Motorbikes hires are abundant (around $5 a day) and taxis service is competitive and cheap too. The retreat offers good quality motorbikes for $15 a day and can arrange taxis for you easily. Bali is a small Island but there is plenty to see. Our retreat will end Wednesday evening. Those of you who wish to stay on till Saturday can do so otherwise you are free to roam, and find your way around. The hotel staff are hugely helpful and Amanda is quite familiar with the terrain so can give you some suggestions on good places to go if you want to expand your horizons. 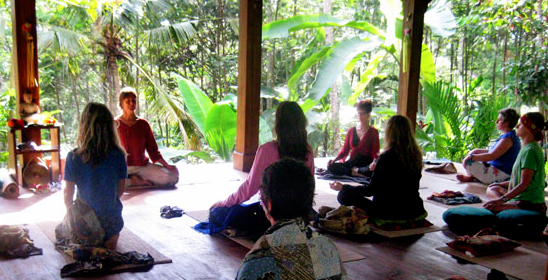 For a limited time, Bambu Indah is reserving use of the facility for The Yoga Tree. All of the units are beautiful, some just bigger than others, different views, and art collections from the owners. Please have a look at the houses available to us and make your choice known to Diane Lion-Giustiniana at diane.manager@bambuindah.com. Use “The Yoga Tree” as a reference. Prices include a complimentary breakfast and afternoon tea. Dinners, snacks etc will be separate however there are a wide range of choices outside the resort so please ask. Please check with Amanda or Perry for respective house prices if you can’t find them on the website. If you are sharing with a friend or spouse, the price remains the same and it is based on the house you hire. Most of the larger houses can accommodate an extra bed and are available upon request for an additional $35USD. Cancellation and refunds etc are in accordance with Bambu Indah’s policy. See their website for details. We are really excited about this event and look forward to working with you. We know you’ll all be a bit weary from the travel so this session won’t be any longer than an hour. The meditation on offer will be a perfect way to send you to a peaceful sleep. 8.00 am to 9.15am Yoga session – a grounding practice for flight recovery and connection to ourselves. 11.00 am Monkey Forest walk – through the famous Monkey Forest sanctuary. Feed the cheeky monkeys, get grounded after your flight and explore what’s around the area in Ubud central. 8.00 pm to 9.15 pm Discussion on how the 5 elements (tattvas) weave their way into Ayurveda. Followed by a restorative practice and meditation. 11.00 am Trip to Tirta Empul (Sacred water temple tour) *time subject to tourist office schedule. 8.00 pm – chat re importance of emotional health, how the chakras carry the blueprint of our creation. 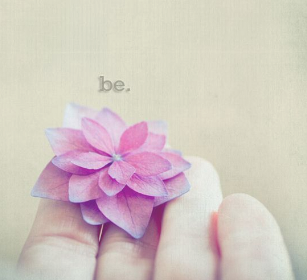 A gentle yoga practice and meditation will follow. 8.00 am to 9.15am A practice that will honor the “fire” in our bellies. 11.00 am – Tour of the Ubud spice market led by Perry who will discuss the Ayurvedic concepts of digestive fire (agni) and how simple everyday spices influence our digestion. 8.00 pm to 9.15 pm Restore and meditate – Ayurveda chat – mind and body restore. July 20 – The Air Element – all movement – Prana being the most pure. 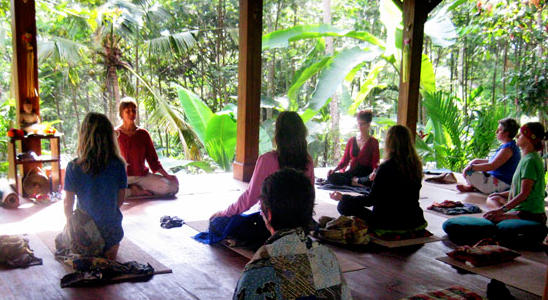 8.00 am to 10.00 am Yoga session – sound as medicine – a little bit of chanting and mantra to go with our practice. Note – There is a probability this could change slightly but the suggested itinerary frames our intention for the 5 days. Everything suggested is optional.